Mediterranean Diet desserts are rich in healthy fruits, nuts and seeds. Enjoy them alone or as a delicious desserts after a Mediterranian Diet main course. Whichever way you choose, you'll be enjoying a tasty treat that's healthy, too. Place the apples into a baking dish. Fill the center core holes with the mixture making sure to push it firmly into the holes. Use the remaining filling mixture to form mounds on the top of the apples. Pour approximately ½ inch of water into the baking dish. Bake at 350 degrees Fahrenheit approximately 40 - 45 minutes (the apple will be soft). Place apples on serving plates. Pour the juices from the baking dish over the apples. Place 1/3 cup water in a small pan and bring to a boil. Add tea bag, honey and lemon juice. Simmer for 1 -2 minutes or until tea mixture reaches the strength you enjoy. Mix all of the fruit together in a bowl. Pour the tea, honey and lemon juice mixture over the fruit. Place fruit salad in the refrigerator to chill. 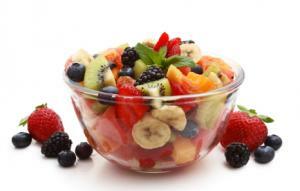 Sprinkle the fresh mint over fruit salad before serving. Rinse peach halves and arrange face up on baking sheet. Mix ricotta cheese thoroughly with honey and cardamom. Spoon honey-ricotta mixture into the peach halves. Bake peaches at 400 degrees for 15 minutes. Grind the almonds in a food processor until coarsely ground while the peaches are baking. Gently toast in a pan over medium heat. 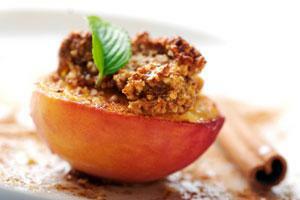 Sprinkle with the course toasted almond meal after removing the peaches from the oven. Mediterranean Diet dessert recipes are very easy to adapt. If you do not like a certain fruit leave it out or substitute one you enjoy eating. You can enjoy these delicious desserts while following the Mediterranean Diet plan to lose weight or maintain your current weight. In addition, according to the American Heart Association, by eating healthy and nutritious foods such as those included in the Mediterranean Diet, your risks of having a stroke or heart attack are reduced. Remember to check with your doctor before beginning any type of diet to make sure it is safe for you.